Recover Lost Instant Messenger Passwords - GTalk, MSN,Yahoo! or Windows Live. Olympic game lovers can track the current location Torch Relay online using Google Maps. The Google Maps page shows the current location of the Torch and also the route in which it will be carried over the globe. In the map, the red colour lines connecting the cities depict the route already covered by the Torch Relay and the black colour lines depicts the route the Torch Relay will follow in the coming days. The current location of the Torch Relay is depicted using a torch icon. When we grabbed the screen shot of the map, the torch is at Dar es Salaam, Tanzania. While Google is progressing so well with new ideas like this, Microsoft and Yahoo seems to be sleeping. 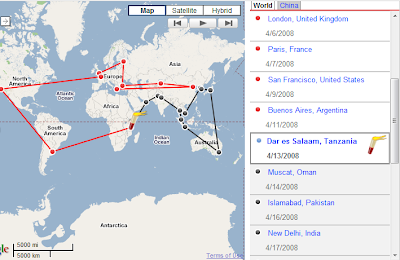 Microsoft and Yahoo have their own version of Map systems but we never see them involving in the events like this.